Paleo Choc-raspberry Raw Cake Recipe. 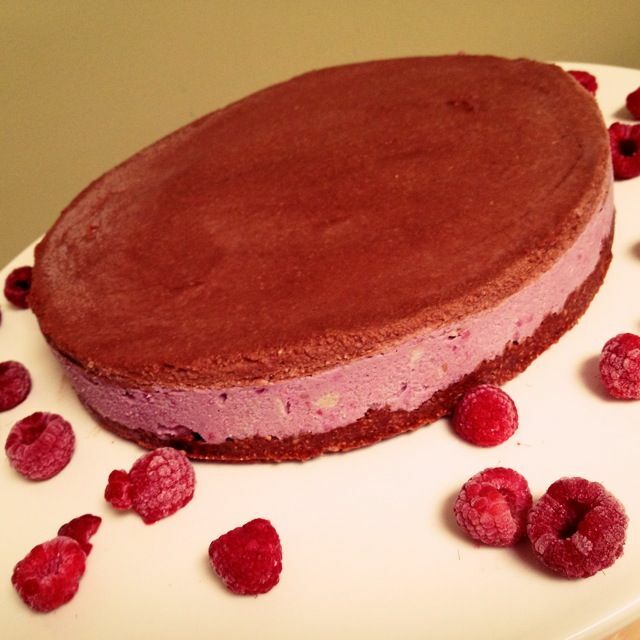 We made this Paleo Choc-raspberry Raw Cake Recipe for you for Valentines Day! You should probably make two! Wishing you all a lovely Valentines Day full of cake! Line a 19cm cake tin with baking paper. Whiz the cashews in a food processor until a fine meal forms. Transfer the cashew meal into a bowl. Add raw cacao, desiccated coconut, natvia, salt and mix until combined. Now onto the extra delicious section. Whiz the cashews in a food processor until a buttery paste forms. Add the melted coconut oil, coconut milk, natvia and mix until well combined. Transfer half of the mixture back into the food processor (leave the other half in the bowl). Spread the raspberry mixture onto the base, making sure it is flat and evenly spread. Back to the filling that was left in the bowl. Add the raw cacao powder to the remaining filling mixture, place back into the food processor and mix until combined - have a taste, should be a chocolate party in your mouth right now! Take out the cake tin from the freezer and spread the chocolate filling mix on top of the raspberry mix. Again, making sure it is even and smooth on the top. Return the cake to the freezer for a further hour. Your paleo choc-raspberry raw cake is now ready to be served to your lover, we served with some extra raspberries on the side...mmm. Cake can be kept in the fridge for up to a week. Running low on coconut products, check out the Niulife site.